If you're looking for classic, luxury furniture with a combination of upscale Victorian style and rustic charm, you may want to find a Paul Robert furniture dealer near you. With over 53 years of experience in the furniture business, Paul Robert is a brand name you can trust for quality home furnishings. You can visit Paul Robert online to see examples of the beautiful, high-end traditional style furniture offered by this manufacturer. You can fill out a form on the website to request information on Paul Robert dealers in your area. You may also want to call some of the local furniture stores in your area and ask if they carry Paul Robert furniture. RW Design and Exchange- Here you can find over 100 different Paul Robert pieces including chairs, chaises, ottomans, sectionals, sofas, settees and tables. The company is located in Dawsonville, Georgia and offers full-service interior design. Interiors Furniture and Design- Offering over 100 Paul Robert selections online, this company also has a showroom in Lancaster, Pennsylvania, and offers free design help from their team of Interior designers and design consultants. Interiors Furniture and Design guarantees low prices on all the furniture they sell. Furniture and Things- This store has a small selection of Paul Robert chairs, sofas and ottomans. You can visit their show room in Elk River, Minnesota. Furniture and Things guarantees the lowest prices on furniture in their area. What makes Paul Robert furniture so appealing and unique is the clever design that combines the rustic look of real leather and a nail trim with luxurious, textured fabrics and embellishments such as fringe and cord. The classic, traditional shapes seen in Paul Robert chairs and sofas make it easy to imagine seeing one of these pieces in the parlor of a 19th century Victorian home. You can also find sofas,chairs, settees and ottomans with a more modern, contemporary look. In addition to traditional style chairs, sofas and chaise lounges, other classic living room furniture includes stylish leather or fabric ottomans and traditional wood coffee tables, end tables and sofa tables with detailed spiral carvings on the legs and a rich, dark stained finish. The Paul Robert dining room table has the same unique spiral carved legs and is large enough to seat eight people. Wood chairs with a fabric back and leather seat help complete this formal dining set. Paul Robert furniture is constructed with the finest materials available including quality lumber, foam and fabrics. This commitment to quality is reflected in every finished piece of Paul Robert furniture. Paul Robert furniture may be a little harder to find than some furniture brands. If you live in a remote area, you may have to travel to a larger metropolitan area to find a dealer or a showroom. 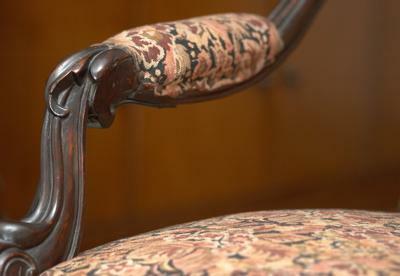 However, the unique, signature look of this quality made furniture makes it worth the extra effort to find it.